Officially 2 months away from my unicorn hair’s first anniversary! LOL. I remember when I first started dreaming about coloring my hair like this. I had so many apprehensions for the longest time. What if I don’t find the right stylist? What if it doesn’t suit me? What if the bleach and hair dye ruin my hair? What if it turns out to be a mess? What if, what if, what if. So how do I do it? How do I maintain my hair? How do I keep my hair alive and kicking? It’s no big secret really. I’m just constantly on the lookout for products that can bring back my hair’s shine, smoothness and nutrients. The winner? Pantene 3 Minute Miracle. I first got to use this baby 2 years ago when I did a project with Pantene in Singapore. It’s supposed to repair 3 months worth of hair damage in just 3 minutes. I know it sounds too good to believe, but I kid you not. 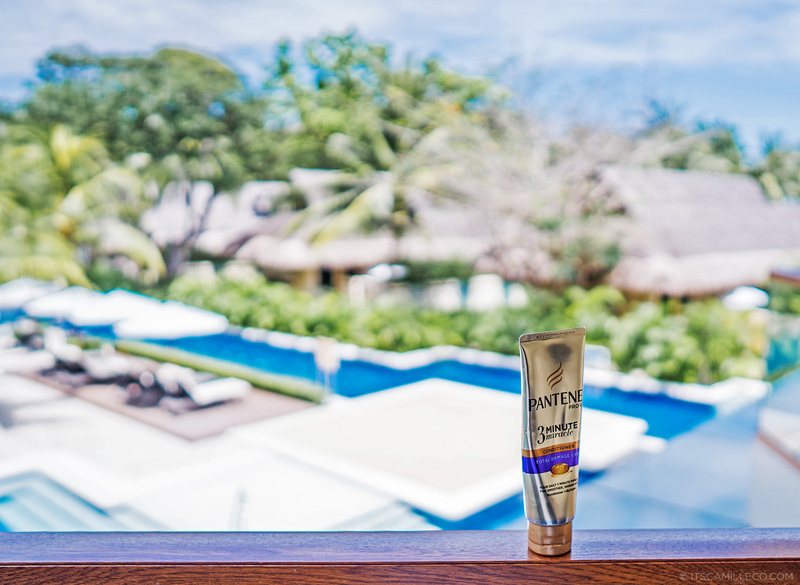 Pantene 3MM better repairs hair damage by penetrating the hair’s inner core and repairing it from deep within. This means it not only provides damage care but helps prevent hair fall too–making sure hair is stronger and healthier. And that’s not all, Pantene 3MM does all these without ruining your hair color. Just look at my hair in all its unicorn glory! Color all you want, Pantene is here to help you achieve your dream hair–hair that is stronger, more beautiful and without limits–so that you (yes you!) can look effortless good, anytime. Thank you! Not so often since I like the faded look. :) Maybe after 2-3 months? You know, it’s hard to not shampoo your hair everyday AT FIRST. But after the adjustment period, you hair and scalp will normalize. Trust me! The way you experiment with colours, prints and textures is simply incredible. Really like what you’re wearing here :) Did you get the top fromn zara philippines? I’m not sure about the 3-minute miracle but I think it works because It seems like your hair don’t really look frizzy or dry even though you dyed your hair a lot, so I will give this a shot because my hair got damaged from rebonding. Thanks!!! :) At least now you can take good care of your hair first and restore its health. Who knows, maybe one day you get your own transformation too! Ganda ng hair mo Queen. I really love your unicorn hair. So much fun reading your blog and looking at your photos. Gusto ko rin magpa color ng hair pero I think it’s not yet the perfect time. And good thing dahil same tayo Pantene user. If you’re reading this Queen Camille, don’t forget that we, your supporters are always here for you. Stay gorgeous and keep slaying all those pics. All the love. Can’t wait to see your next updates and your adventures in Bali. Awww thanks Clara! So sweet of you!!! Super love your unicorn hair. Want to color my hair like that too pero I don’t know if it suits my skin. I’m not that white and not brown too. Slaying all your photos. All the love Queen. Hair goals!! I also want to try that to my hair but I’m scared if it will suit to me. Haha! 2 years na ba? I want to dye my hair actually, it’s just that i’m afraid it’ll get more damaged than it already is. Do you have any natural remedy for slightly damaged hair that you have already tried? Hmmm I haven’t tried any natural ones, but I did hear good things about them! Your hair really does look good!!!! Thank you for the idea! I started dyeing my hair last year but I need to dye it again with black because colored hair is not allowed in school 😞 My hair gets dry sometimes so I’ll try to use that product haha! Hi Camille! You are my hair goals!! <3 Btw, I'm planning a trip to Bohol and I was wondering what resort do you think is better, Hennan or Amorita? Or keep it in rotation with a few other products :) Do it!!!! Unicorn haired Camille for the win! I’m likewise happy that you went for it Cams because it suits you so well. Sobrang nakakaloka rin maka-damage ang color ng hair kaya buti may mga products that you try and share with us na talagang effective. Damaged na hair ko. Hopefully I can recover pa rin with this hehe :) Ang ganda ng damit mo! Ansaveh ng door? LOL. :p So cute dear! Laveeeet! How are you now? Hope you’re doing well. You know, I just recently got back from long blog hiatus and have just redesigned my blog. Now I’m writing again and reconnecting with long time blogger friends like you. Hope you’re ok dear! Keep in touch!